We're looking at some more isometric training today. This time instead of focusing on the core we are going to be working on our back. Many people use their arms and barley their back when performing pull-ups. Doing Isometric Pull-Ups is the best way to learn to recruit the proper back muscles into your pull-ups. Using this form of isometrics will also strengthen your rhomboids and lower traps. Strengthening these muscles is shown to help assist your posture and limit the chance of getting a shoulder injury. You should be able to perform pull-ups with at least the same amount of weight that you can bench press. Ideally, you should be able to pull more weight then you can push. But a 1 to 1 ratio is a good start. So if you weigh 180 pounds and can bench press 250lbs, you should be able to perform pull-ups with 70lbs of additional weight strapped to you. There are three different isometric pull-up holds that we will outline in this guide. The DeadHang gets commonly used as an introduction to calisthenics. It is used to develop foundational strength in your body. It focuses mostly on increasing your grip strength. Step 1: Grab a pull-up bar or rings with your arms extended. Pull your shoulder blades back and down pushing your chest up. Focus on engaging the muscles in your back. Step 2: Hold this position for as long as you can without losing your form. This exercise is also commonly used for stretching out the torso to help decompress the spine. It gets inserted in many more advanced exercise routines. Step 1: Grap the bar and with a shoulder width grip. Move into the top of the pull-up position. Raise your body high enough that your chin is above the bar. Step 2: Hold this position as long as you can keep your chin above the bar. If this exercise is too hard, you can use resistance bands to reduce the weight you need to hold. You should notice a much higher activation of the muscles in your back with this version. 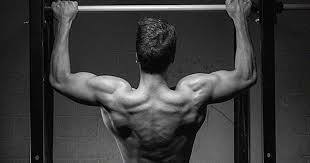 If you are new to pull-ups, make sure to focus on the muscles activated in your back. These are the muscles you should be using for every pull-up you do. Step 1: Again use a shoulder width grip and grab the bar with your hands using an overhand grip. Step 2: Lift your body off of the floor until there is a 90-degree bend at your elbows. Keep your elbows tight towards your ribs. You can also use resistance bands for this version. This version will hit your biceps the hardest. If you are finding the isometric holds above are too simple for you there are a couple of ways that you can increase its difficulty level. 1) Use the holds at the end of your training routine. When you finish your training routine, your muscles will be in a fatigued state. Performing the holds with tired muscles will significantly increase its difficulty level. 2) Strap Additional weight to your body. Your body will get conditioned to the weight if you keep using the same amount. Every week or two focus on increasing the weight by one to five pounds. You should use progressive overload with these holds by continually increasing the amount of weight strapped to your body. Raising your knees or legs will increase the core difficulty of these holds. Raising your knees is easier and where you should start first. To continue making progress switch from raising your knees to extending your legs so that your body forms the shape of an L.
You can perform the side to side method with each of the isometric holds outlined above. The movements are the same as described above but you will add in the side to side movement. All you need to do is move your chin to your left and then right hand when performing the isometric hold. It does not matter if your goal is to do your first pull-up or do more repetitions isometric training can help you get there.